It’s all very well being able to carry around a few thousand songs in your pocket, but they sound terrible when played through the tiny speakers on a mobile device – and you can completely forget being able hear the output above any normal level of background noise. The Bolse SZ-801 comes to the rescue without breaking the bank. It’s a budget portable speaker with sound quality and output volume that will quite literally blow you away. The Bolse SZ-801 is available on Amazon for $40 (out of stock at the time of publication). A lot of design comparisons can be made between this and the $150 Jawbone Jambox – but the Bolse SZ-801 weighs in at one third of the price. Other budget Bluetooth speakers at a similar price point simply don’t come close. Included in the box is a micro-USB charging cable (no AC adaptor though), and a 3.5mm passthrough for plugging directly into devices without Bluetooth. The Bolse SZ-801 is weighty but very small; at just under 500 grams and 4cm deep, it looks deceptively modest. 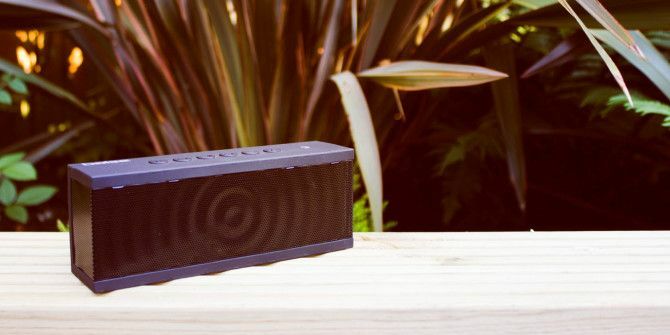 With a matte black rubberised texture, the plastic casing feels solid and certainly ticks all the boxes for not looking cheap; but it’s also accompanied by a rather attractive speaker grill that wraps around the front and the sides. The concentric waves emanating from the centre of the grill probably serve no function, but they make it seem like the SZ-801 is so loud it’s actually managed to make ripples in the space time continuum. Make no mistake, this is a classy piece of modern design, and not something you’d expect to see on a bit of hardware that costs less than $50. On the technical front, two 40mm drivers provide a total of 12 watt output – but there’s also a cavity in the centre (or some other kind of dark magic I don’t fully understand), which gives it the ability to produce such deep bass. The modesty implied by its size is shattered when you actually turn it on. From the offset, I was blown away by both the quality and volume. I have absolutely no idea how something this small can sound so good, or so loud. Holding the unit in my hand, I almost dropped it from the initial shock of the thumping bass as it vibrated into my fingers – I wasn’t expecting that. Seriously: size can be deceptive, and damn – this speaker is good. Seated atop the device are 6 low profile buttons: 3 buttons for controlling media, 2 volume buttons, and a “call” button. The call button answers an incoming call, or you can long press to summon Siri on iOS. A hefty 8-hour battery powers the unit, which is more than enough to last even the lengthiest of barbeque sessions, or afternoons at the beach. For general use, you won’t want to run this at full volume anyway, so it’ll actually last a lot longer – 20 hours at low-medium volume would not be unreasonable. Recharging is done through the micro-USB port at the rear. Manually pairing with my iPhone and iPad presented no problems, and the SZ-801 promptly reconnected after a power-off. Unfortunately, I didn’t have so much luck with the smart NFC functionality. I tried with both a Nexus 7 and an HTC One X – placing the NFC-enabled mobile devices onto the SZ-801 immediately paired them with a discreet beep to let me know it had worked; but none of the system audio was actually piped into the speaker. I checked the Bluetooth speaker settings, and both were sent to transmit call and system audio. Eventually, I fixed the problem by power-cycling the speakers – they correctly reconnected to the last known device, and sound transmission worked. I’m not sure if this is an Android error, or a problem with the speakers because they were already connected to another device at the time – but even with a power cycle required, it’s still potentially easier than having to navigate into Bluetooth settings and manually pair devices. If I were forced at gunpoint to say something bad about these speakers, it would be that the voice played when connecting, and the beep when you reach maximum volume, is obnoxiously loud. It’s also not waterproof in any way, so don’t throw it in the pool and be a little careful on those beach trips. It’s a minor complaint though – at this price, you’d be insane to not snap them up. How do I win the Bolse SZ-801? Congratulations, Jeff Cook! You would have received an email from jackson@makeuseof.com. Please respond before August 9 to claim your prize. Enquires beyond this date will not be entertained. This giveaway begins now and ends Friday, July 25. The winner will be selected at random and informed via email. View the list of winners here. Explore more about: Bluetooth, MakeUseOf Giveaway, NFC. Keyboard review seemed comprehensive. I certainly didn't come away after reading/watching it with questions. the review was very informative. I like it! Great review! The Brydge+ is good for heavy iPad users! It was a good review! I think you did a good job reviewing it! In principle a good idea if your device battery can sustain prolonged bluetooth broadcasting.. The review did not mention Brydge+. I think you did a good job reviewing it, but that keyboards are something a person has to experience tangibly. I think I like it. 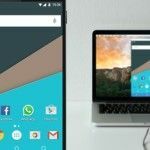 The review for the Brydge + ipad review was really good, easy to understand. Why was this question with the speaker review? How would you compare this to the the Bose sound link mini Bluetooth speaker? As always, a very nice review. I'm always happy with what I read! I love the reviews on makeuseof because they are thorough and complete as always... and this review is no exception. Thanks! Hope this time luck works...!!!!!!!!!! It was very informative.. good job. I don’t know about the Brydge+ Keyboard, because this review didn’t mention it all, nor do I know why it would. Yes, the review provided sufficient details, but about the speaker, not the Brydge+ Keybaord. Why is it that on any giveaway whenever I hit "Enter Now!" nothing happens? I have an email address just for contests and it would not accept that email address. When I used another it worked fine. Maybe try that. The review was great, I had no questions after reading through! I like the sound of this speaker. The review was adequately detailed. I thought you did a good job on the keyboard review, as always. Looks fairly nice. I liked the keyboard and the review. These speakers are OK if you really need them and have money burning holes in you pockets. I don't know about the Brydge+ Keyboard, because this review didn't mention it all, nor do I know why it would. Yes, the review provided sufficient details, but about the speaker, not the Brydge+ Keybaord. This review and the keyboard were exceptional and definitely provided sufficient details! I even placed the keyboard in my cart after reading your review! I read the keyboard review and it was an excellent and got me interested in that product too. by the way this review was also great! I appreciate your balanced review... the pros and the cons! Great review.Very detailed and interesting as usual. The portability would be nice, for so many different reasons. This speaker would be great for the garage when I'm out working on something. I like that it includes Bluetooth, NFC and the 3.5mm connector too. I didn't know about the keyboard, but then it's fine because I don't own any Apple device. I would want the speaker though. It looks cool! Precise and with a mic,though I need a gadget to pair it with.It will do when that time comes. I have no opinion about the keyboard, but this speaker looks great! The Brydge keyboard looks good but I'd need a mini version - the review was great. The Bolse isn't bad either. Had a portable speakers then but never had those bluetooth thingie. Would be cool for sure to own one. Thanks for the possibility. Going by the review, the Bolse SZ-801 Smart NFC Bluetooth Speaker seems to be a fantastic gadget that I would want to buy for myself. However, I feel your review could have provided more details about how it performs for various genres and frequencies. How does its handling of Hip-Hop compare to that of Jazz? Can it handle high-end frequencies well enough? These are some of the questions I would have liked to see answered in this review. Thanks you for the giveaway. I do not think anything of the keyboard, as I do not even own a thing that could possibly use it! LOL But I like the review of this little speaker. I need a speaker like this, as my wonderful HUGE reciever just blew out a while ago and I have yet to bring it in somewhere to repair it, for, alas again, the big speakers I had to go with it, well I blew those out too, the reciever is too powerful for them and they were used anyway. I NEED MUSIC and need it badly. I like the Brydge, but that has nothing to do with this review though. The Brydge keyboard makes a lot of sense. So does this wireless speaker. Which one were we talking about? did not check it out....sorry. I think that's for another giveaway . I haven't read it yet. Good review, love that you point out not only pros, but cons as well, very honest. OMG, Bose is a great name & would be my first choice of speaker but can never afford it. SOS. Help. Pick me, pick me! Your next winner!!! Show me the money!!! It would be a dream come true & means more to me than anyone else to win. Starving artist here desperately needs the bluetooth speaker to work & eat again. Winner, winnner. Chicken dinner. A life changing experience. Top of my bucket list. Thanks for the awesomeness, the contest, & generosity. Dear Santa: I’ve been nice. My X-Mas wish this year is to win this contest! the keyboard review was good. covered sufficient details. Great review with sufficient enough info. Thanks! With a name like Bolse it has to sound good right!? :) I've seen and heard a few other small bluetooth enabled portable speakers and most left much to be desired, so it this unit performs as described in the review - than I would love one. Yep, I too am not sure about the Brydge keyboard. I DO, however, LOVE this little speaker. I've been looking for a decent little Bluetooth speaker for my Android phone. I think this one is the one I'll be buying--as soon as Amazon gets them back in stock! The question asks what you think of the Brydge+ keyboard, yet the review's for the Bolse SZ-801 speaker. Judging by the review, which provided more than sufficient details, this sounds like a great little portable speaker. I have wanted a portable Bluetooth Speaker for a while! Quite handy to have around. I think you have a wrong question for this review. The review was well written and informative. The KB is nice and the review seems to provide all the details one needs. It definitely provided enough information, I still wouldn't purchase one. Yes. Like the review. Gave me answers I need. Read the review. It's great, detailed and infomative.The keyboard seems pretty convenient. Thankee guys! I thought the article for Brydge+ was done very professionally. Yes, your review was very informative. ... for now! I'll let you know if you've missed anything upon receiving this beauty. I don't own Apple products so I did not read the review. However, I like the speakers though. A great surprise that they have good bass. I would try Bolse speaker by myself... However it is a great review. Cheers! I think noth reviews were very helpful and I would buy the Bolse speaker! I do not know anything about a keyboard for this, but I could use decent speakers for my devices! Actually i never used this device but After watching the review of Brydge keyboard. I feel its nice to use in daily life and i would recommend people o use it. cool speakers Bolse SZ less wires. I don't know nothing 'bout no Brydge+ keyboard. The Brydge+ keyboard is cool, though I'd never use it myself, not using tablets in general. I thought your review of the Bolse speaker was thorough and highlighted the details we would need to consider this for using with our bluetooth devices. The review is good and the price was a surprise !! Yes it gave me the information I was looking for. The review was great and insightful. I liked the fact that James Bruce gave a brief history of it starting off as a Kickstarter. The Brydge+ keyboard is great, I agree that the iPad is more productive with a keyboard such as this one. It also looked sturdy with a secure grip. I'm sold on it! Yes, it was good & I want one! This is not the review for the keyboard but this review was excellent as always. The speaker review was very informative. MakeUseOf reviews are very thorough and always provide a lot of details. Re the Brydge+ keyboard: I have a different model, which I like very much, but the built-in speakers on the Brydge+ unit would be a very appealing feature. Information and detail in this review are sufficient, but would also provide a solid basis for comparison for someone who would like to shop around. Re the Bolse SZ-801 Smart NFC Bluetooth Speaker: this looks like a great little speaker for the money, and it would probably be hard to go wrong. However, as previously noted, the company name does sound like a sound-alike for Bose, and I'd feel more comfortable if company information were included in the review. Your reviews always provide plenty of details. Covered all the bases for me, thanks! Loved your review of the Brydge+ keyboard. LOL - think that question was in the wrong place. Wrong question! Great speakers, would love to try them! The reviews on this blog are very thorough, and they give all of the details you would want. I like it but I want this speaker more! From the sounds of it this would be great to replace my old speaker in my office. It was interesting but I 'dont use an iPad. Seems like a good quality small portable speaker - I likee! Don't see a review for the keyboard, but I like the review for the speaker. This review was for a Bolse Speaker not the Bridge + keyboard, but it was a great review! Not interested in the Brydge+ keyboard, but the Bolse Speaker sounds great! Looks cool and yes, as always, the review is very thorough and verbose. Didn't see it but the speaker looks great. Great review! I love the Brydge+ keyboard. Skimmed the review didn't seem something I was interested in. Review seemed fine. Review was ok! If I had a iPad I would consider a brydge+ keyboard! It was a good review,like all others... p.s I really hope that all giveaways are open worldwide.. I thought the Brydge+ review was well done, as usual, and told me everything I needed to know . Not sure exactly how this compares to the many other options that seem to offer similar features. I do like that there are much more dedicated buttons on this. It seems to be a good product with a solid review. Was a nice review, like the deep explanation of the clamshell, which looked curious to me. i did see the brydge keyboard, but that was for an i-pad and I dont own any apple products. Looks like a powerful speaker. Would love to try this. Not sure about the keyboard, here to see the speaker.. I don't know about some keyboard, but the speaker looks great. Wrong question... this is review for a different product. Good review, i like it and like this speaker! Sounds like just what I need for my tablets - or even for my notebook. Awesome, both product and your review. I don't have an iPad myself, I'm pretty much an Apple hater here, so I won't talk much about the Brydge+. The keyboard looks amazing given its price and features, though it would be even greater if it can be connected with a wired connection as well. Also the review is great, even if I still have no intention of buying it. Now back to the speaker. Currently the best budget mini-speaker I could think of is the X-mini capsule speaker (lol...). After watching the video review, I was blown away by the bass on that thing, especially on something $10 cheaper than the X-mini. Your review of the Brydge+ keyboard provided a surprising amount of detail concerning the Bolse SZ-801. Yes! I've been waiting for something like this. Good review and if I don't win it (which I won't) I will probably buy it anyway. One, I don’t think you intended to ask about the keyboard so telling about speaker. It looks really great for that price, I would have definitely bought if it was available. Two, about the keyboard, the Bluetooth factor is quite nice, and it's definitely priced right, but all things consider, I don't have an iOS device, so (given the iDevice centric design) it'd be of no use to me. I think it's a great product. The review is very good. I'd love to try this out with my raspberry pi-based mini-htpc setup I have in my room. I've got some cheap speakers now, but these would really help. Thank you very much the giveaway! The price seems more than right for the quality. Well, you reviewed a speaker here, not a keyboard, so... not really. considering the fact that the review was for a accessory(no matter how productive it might end up) the details of the review were more than enough.